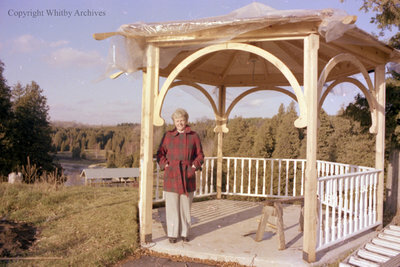 A colour negative of Connie Cullen standing in the gazebo lookout at Cullen Gardens and Miniature Village. The kissing bridge can be seen in the distance. Gazebo Lookout At Cullen Gardens, c.1979, Photographer Unknown. Whitby Archives A2013_042_154A. Scanned from a colour negative.